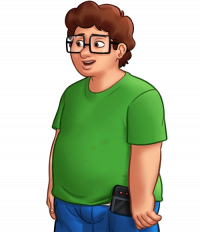 Erik is a chubby teen who possesses a short stature with wavy chestnut hair and gray eyes. To top it off, his face is decorated with oversized glasses and freckles. His typical outfit consist of a green T‐shirt with blue pants. Erik is a stereotypical computer nerd. He is an awkward gamer shut‐in who doesn't go out and socialize much. However, Erik is the main character's sidekick and he's always willing to help him perform just about any tasks. Showing more interest in orcettes than in real girls, his attitude sometimes worries those around him. Erik is the main character's best friend. Just like him, Erik lost his father but at a young age. Mrs. Johnson says this may be the reason he is the way he is, but asks the main character to help him. See Erik's route for the complete walkthrough.